Sailors like sharing their experiences in social media groups. 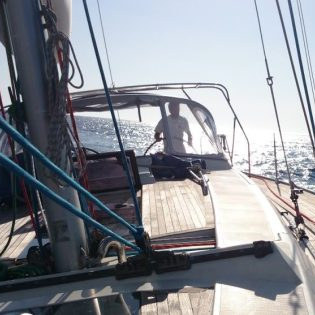 Some weeks ago, one of the “women who sail in the Med” facebook group member shared some instructions and thoughts about their stay in Rabat’s marina (Bouregreg Marina in Salé, to be precise). We found those instructions very useful. We would like to thank Robin Felicity Foley for giving us the agreement to publish his comments in our blog. From one of the Spanish sailing group, we got recommended not to motor close to Moroccan coast – which was also a good advice. We strongly recommend to avoid motoring especially at night in the 30 nm band off the coast. If you motor during the day, we recommend you watch out for the all time: there are a lot of fishing nets, fishing lines and it is easy to pass on one… and it is a pain to get rid of it! We caught one in our way from Rabat to La Graciosa!!! Some have buoys, but some are just marked with an empty Coke bottle. Also, when sailing at night be careful with the uncharted well-heads and drills: a non-moving red flashing light, surrounded by white flashing lights… this is most probably a well-head. You can find them even at 50 nm (or more) off the coast, and the flashing lights are not always visible in the swell. For those who may be interested, here is an overview of the marina at Rabat and its idiosyncrasies! RABAT – first things first….getting here. This marina is situated a little ways up a river – very sheltered location once you get here. Best thing is to call ahead to the Capitainerie (+212 537849900) and state when you would like to arrive – they check on Windguru to see what the swell size is (tide and wind are not as important but may factor in). They absolutely will not let you in if the swell/wave height is more than 2 – 2.5m. Once you have established that they have room for you and that the weather is okay for entry, you will need to call the pilot on VHF 10 and stand by about 0.5 – 1nm off the entrance to the harbour. They will come out in a red RIB and guide you through the entrance and up the river. I am not sure what the draft is, but our depth gauge showed 5-6m at the entrance and most of the way in at 1/2 way through ebb tide. Make sure you have your Q flag and Moroccan flag clearly displayed – some British boats came in flying Tunisian flags (!) and although no one said anything, I pointed it out and they quickly changed. The RIB will guide you to the welcome pontoon immediately in front of the Capitainerie where you will tie up (or raft up if there is more than one boat) and await customs and police. The officials are very friendly and will board your boat with documents to complete (basically an embarcation card like the ones you get at the airport sometimes); they will then take your passports, boat documents and the completed embarcation cards for ‘processing’ and will return them to you later. A cursory inspection will be carried out by one or more members of the team (they’ll look in your cupboards and ask if there is anything to declare). BEWARE – they DO NOT allow drones in Morocco! I am not sure what happens to people who have drones on board – whether they have to leave them with the police while in Rabat or what, but you may want to check this out before arriving! At no time were we asked for any kind of ‘gift’ or baksheesh. The RIB will then guide you to your berth and the pilot will assist you with tying up. You will proceed to the capitainerie at your leisure to register your arrival with them. In our experience, I would like to add that you also need to check the tides. You will need to enter and get out of the marina at rising tide, before the high tide. This means you will have the ocean still going up into the river, and a more water into the dragged parts of the river. Some parts of the dragged river are still shallow (around 3.5 m at high tide). During ebb tide, the tide (from the river) and ocean’s swell are not mixing fairly and you want to avoid that. If because of the tides you cannot enter in the Bouregreg you will be routed Mohamedia (in Casablanca) which is more expensive than Rabat. This next part is also heavily inspired by Robin’s post, but I adapted it to our own experience in Bouregreg. The marina is small, with only a few places for about 10-15 visiting boats – one of the pontoon is reserved for the King’s fleet. It opened around 2003 and the buildings (apartments, restaurants and shops) are still being built and sold. Many locals come out in the evenings (particularly on weekends) to stroll, have coffee and wander around the marina. The place is well guarded and the pontoons are secure (the guards keep an eagle eye out to make sure no one but boat owners and crew go onto the pontoons). The tramway (still like new) is a great way to get around. The nearest stop is “Bab L’Mrissa”, just by the marina. There are two lines and a single trip costs 6 dirhams (about 0.60 €). The two lines cross over for about 4 stops but you would take line #2 to get to the Medina in Rabat (and the souk and the casbah). You can also use the small rowing boat services to cross the river, which is fun! The marina is situated across the river from Rabat in Salé – it has its own medina and souk area and is much less of a touristic place. The marina has toilet & shower facilities (get the key at the Capitainerie). Depending on your berth, it can be a long walk to get there. The plumbing is a little dodgy and if there are a number of people taking showers you won’t get much water! The toilets are fine. Bouregreg Marina is a good place to leave your boat (there is no wind most of the time in Rabat) and go travelling – the train station is on line #1 of the tramway. It is also a 15 minute walk from the “Bab L’Missa” stop (close to the marina). Buy your train tickets at the station (cash only most of the time!) the day before and get reserved seating in 1st class (we always travelled in 2nd class buying to tickets 10 minutes in advance without issues). Fez is 2½ hours away and Marrakech is about 4½ hours. The trains are clean and comfortable. The marina has a guest internet service which comes and goes during the day, so if you need a good internet connection you’ll have to use something else. If you plan to stay in Morocco and travel around, get a SIM card (Orange or Maroc Telecom). Just get into a shop with the Orange or Maroc Telecom sign (you’ll need your passport). It’s easy to get extra gigs on the go everywhere in Marocco. A few gigs will cost you a few tens of dirhams. The Capitainerie has a laundry service that will come and collect your laundry and wash and dry it (in the same day) for a fee (25 dihrams / kg) – not cheap, but convenient. The marina has a fuel dock; although we did not buy any, they have both petrol and diesel (cheaper than in Europe). The restaurants and cafés around the marina are nice enough but expensive by Moroccan standards. There are very few places that serve alcohol and it’ll be the same in the whole country. Leaving the marina is basically the entry in reverse: look at the weather/ wave forecast, talk to the pilot, Capitainerie and police and let them know when you wish to depart. They will give you a time (based on the tides). Pay your bill, move your boat to the police dock (within the marina area) where you will check out, one hour before the pilot wants to lead you out to the ocean. You need to check in and out at every port, so if you visit many Moroccan ports, you will have lots of stamps in your passport! The pilot will then lead you out and you’re on your way! We had a nice experience in Morocco, and we certainly recommend you to visit lovely country. We suggest you dress modestly (no matter what you see other foreigners doing), be patient, try and learn a few words of French/Arabic and don’t be afraid to ask for help if you get lost or cannot find something! Our friends from Ventus made a good job listing the cost of their trip to Morocco, you can check it out here.